Home / Reviews / Tremors: A Cold Day In Hell Blu-ray Review! It’s so interesting to see how certain franchises take on a life of their own. You really never know what’s going to take root in the public consciousness. Take for instance the Tremors film. It started out as an ode to low budget B-movies and starred Kevin Bacon and was released theatrically, the franchise then went on to direct to DVD sequels starring Michael Gross and now there’s a planned television series which will star Kevin Bacon once again. 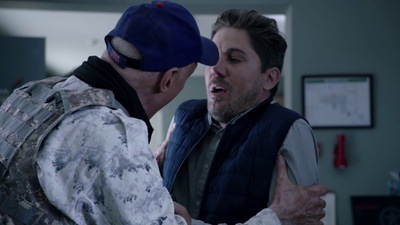 However, before that show premieres the newest chapter in the Tremor’s saga, Tremors: A Cold Day in Hell, out now on Blu-ray has been released once again starring Michael Gross as Burt Gummer. This time out, we’re no longer in the barren dry desert, we’re in the Arctic Tundra, ice, snow, and Graboids? Yep, it’s happening people. Burt hasn’t change since we last saw him, hell… He really hasn’t changed from the first movie. He still loves his guns and is having success with his survival videos, however in a bit of a tax quandary, Burt is at a crossroads. He’s running a remodeled Chang’s, the store from the first film, when he receives a phone call from a fan up north. The fan says that there’s a suspicion that the Graboids have found a new lair under the ice and snow. 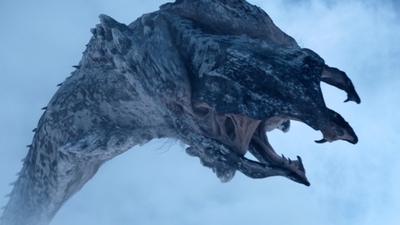 If you think about, the graboids are a pretty resilient bunch to make it in the hot desert and the wet arctic, but this is Tremors, not The Post. Burt decides to check it out, along with his son Travis (Jamie Kennedy). Thankfully, Burt has his winter camouflage to blend in, I mean why wouldn’t he own something like that living in the desert? It’s not really the Arctic Tundra though, because a heat wave has melted the snow and ice during these unseasonably warm weather conditions. It’s a great choice the move the series away from the original town and location, for a while I kept thinking, “Why don’t these people just move?” But again, if we’ve learned anything from Jaws IV: The Revenge, it doesn’t matter where you go, if a crazy animal, shark or Graboid wants to get a hold of you, they will. The film is a lot of fun, and while there are scenes reminiscent and even some exactly like the previous films, one doesn’t really mind. Look, you’re watching a Tremors film, if you put this film in your Blu-ray player don’t expect Shakespeare, expect to sit back, eat some popcorn and have fun. In today’s day and age a little over an hour of escapism is a welcome relief. 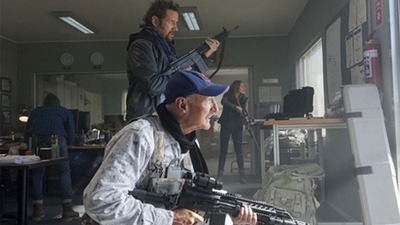 Michael Gross is still awesome at playing Burt, who loves to chew up the scenery and throw out a good gun pun (yes, I meant that to rhyme) any day of the week. I don’t think anyone would have expected, watching the original Tremors that Michael Gross would be leading the franchise, but he does a hell of a job and is the heart of the series. 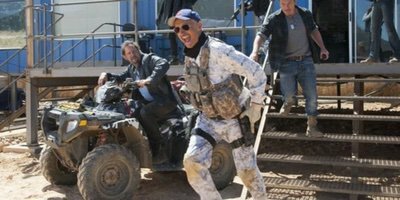 Tremors: A Cold Day in Hell arrives on Blu-ray in a fine transfer. It was shot digitally and while normally it gives the picture a non-theatrical look. Here the transfer is actually really good. The fine details are present, there is little picture loss even in the darker scenes and you can really see the backgrounds and environments. It’s better than it needs to be. The Making of Tremors: A Cold Day in Hell – It’s a fifteen minute feature split up into parts. It’s fun to watch and explores different aspects of making the film. Anatomy of a Scene – This is a look at making the first ever Tremors water attack sequence. Inside Chang’s Market – This is a look at the set for the film with some fun Easter Eggs for fans. Overall, if you’re a fan of the Tremors franchise, the new location will be a welcome change of pace. Michael Gross is still a kick to watch as Burt and there’s still a lot of life left in the series. It’s still fun to see these underground monsters pick people off one by one and the picture quality is great! I say, check it out! Tremors: A Cold Day in Hell is out now on Blu-ray! Movie Review! 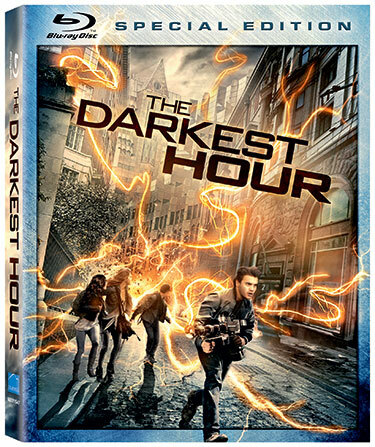 The Darkest Hour Now Out On Blu Ray and DVD! With Emile Hirsch! Max Minghella! Olivia Thirlby! 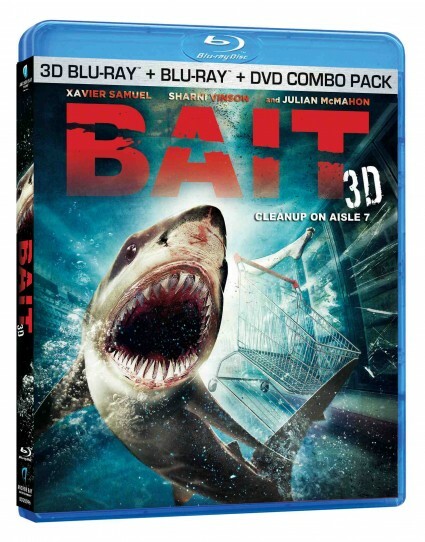 Bait 3D Blu-Ray Review! Killer Sharks In A Supermarket! Oh Yeah! Can I Get A Hell Yes!